The Ready For Hillary Super PAC announced Tuesday the hiring of Quentin James as its "Black Americans Director." 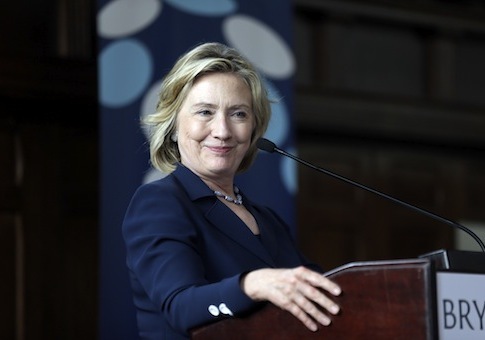 Ready For Hillary, dubbed Hillary Clinton’s presidential "campaign in waiting," launched earlier this year, fueling the speculation that the former secretary of state has decided to run as the Democrats’ successor to President Barack Obama. The hiring of James is a curious addition to the Clinton operation, which is known for being both extremely protective of the Hillary Clinton brand and vindictive against those who speak poorly of the Clintons. A former director of the Student Sierra Coalition, an environmentalist organization based in Washington, D.C., James was highly suspicious of Hillary Clinton’s ties to lobbyists supporting the Keystone XL pipeline. "Attendees will gather outside of the Ronald Reagan Building, where the State Department will hold a hearing about the pipeline. This is the final hearing in a process riddled with controversy. The State Department's process has recently been called into question after internal emails were discovered connecting a major lobbyist for the project to Secretary of State Hilary Clinton, and management of the hearings have seemingly favored Big Oil and their supporters." The referenced emails stem from a 2010 Freedom of Information Act request and subsequent lawsuit brought against the State Department by another environmentalist group, Friends of the Earth. The group’s lawsuit sought correspondence between the State Department and top TransCanada lobbyist Paul Elliott. Elliott served on Hillary Clinton’s 2008 presidential campaign’s delegate selection team as well as on Hillary Clinton’s 2000 U.S. Senate campaign and Bill Clinton’s 1996 reelection campaign. Since 2011, Friends of the Earth has continued its quest to uncover additional correspondence between the State Department and lobbyists for the Keystone XL pipeline who have ties to Clinton, current Secretary of State John Kerry, and Obama. Heading the list is former Obama official and current corporate lobbyist, SKDKnickerbocker principal Anita Dunn. This entry was posted in Politics and tagged Anita Dunn, Hillary Clinton, Keystone, Ready for Hillary. Bookmark the permalink.